It is a dark passage descending down a smooth, sloping ramp to an eerily lit room. Only the indistinct outlines of a deep honeycombed ceiling and walls are illuminated in the shafts of amber light coming from the room at the end of the passage, casting odd shadows back up the corridor. The boom of a deep hum and faint mechanical noises echo up from the cavernous room. As the shot travels down the hall toward the room recessed into the floor at its end, it approaches the back of the heads of a womanish creature with the horns of a gazelle and the beak of some beautiful-feminine-bird and a scaled lizard man with an array of multiple horns on his head who are intently working on something. As the shot get closer, it reveals a science laboratory recessed into the floor of the dimly lit room. Glass tanks lined in black occupied much of the lab. The two scientists wear surgical masks and gloves and are dressed in a sheer single piece of cloth, like a medical gown. The female scientist is holding some kind of tool over what they’re working on that is lying on a table in front of them. As the shot reveals the room, there on the oval stainless steel slab, lies the naked body of a well built black man. Positioned above his muscular, dark body is an array of technical equipment. 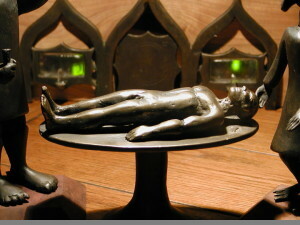 His body is cast in a bright white light by the apparatus above him. The titles letters appear in a cool way~ MYTH, then under it “the origin of man” wavers into view in small letters. Thank you a lot for sharing this with all of us you really know what you are talking about! Bookmarked. Please additionally discuss with my site =). We may have a hyperlink exchange arrangement between us! Thanks for sharing superb informations. Your web-site is so cool. I am impressed by the details that youâ€™ve on this web site. It reveals how nicely you perceive this subject. Bookmarked this website page, will come back for extra articles. You, my friend, ROCK! I found just the info I already searched all over the place and just could not come across. What an ideal web-site.